A spectacular stage show performed by a group of physically and mentally challenged Bangladeshi artistes at an international event here has enthralled the audience and earned huge acclamation for their talents. The delegation comprising five boys and four girls of SWID Bangladesh performed an impressive dance drama titled -Basonto (spring) and Ruposhi Bangla- with the theme of natural beauty of Bangladesh and its socio-economic advancement. Hundreds of audience of different countries including the host India burst into cheers when a Bangladeshi artistes wearing “Pajama, Punjabee and Mujib coat’ came to the stage and started delivering the historic 7th March speech of Father of the Nation Bangabandhu Sheikh Mujibur Rahman as part of the drama. “It is obviously a mind blowing performance…the Bangladeshi performers have earned the heart of the audience… they should be nurtured properly,” said Prof. Vikas Bhatia who joined a seminar on the sidelines of the event as the chief guest. Performers of 18 countries across the world including Russia, United Kingdom, Australia, Tajikistan, Sri Lanka, Iran, Kenya and host India participated in the global event followed by seminars, symposium and workshops for the development of physically and mentally challenged children. Ministers, bureaucrats, physicians, social workers, physiotherapists and cultural activists spoke at various seminars and workshops on physical and mental developments of the challenged children during the 3-day event. Earlier, Justice Dipak Misra, a judge of the Supreme Court of India, formally inaugurated the global event called “SAMBHAV” at Multipurpose Hall, India International Centre (IIC) in Lodi Estate here on November 2. Association for Learning Performing Arts and Normative Action (A.L.P.A.N.A.) organised the event aimed at showcasing the abilities of the differently abled people in the field of performing arts. Journalist Sadhon Ghosh, team leader of Bangladesh delegation and Md. Amit Hasan, dance teacher and choreographer of the performance, expressed their happiness over the performance of their boys and girls. 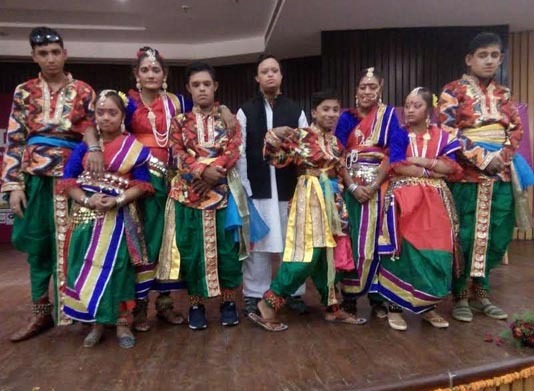 “We are extremely happy with the performance of the artistes,” said Ghosh seeking government’s support to nurture the physically and mentally challenged children for their welfare. Bangladesh high commission in New Delhi provided necessary support to the delegation during their stay in the Indian capital. Prior to their departure for Dhaka, the Bangladesh delegation met Bangladesh High Commissioner to India Sayed Muazzem Ali on Wednesday at the latter’s office. During the meeting, Ali talked to the children and their team leader and enquired about their well-being saying that the present government led by Prime Minister Sheikh Hasina has been working for the welfare of the physically and mentally challenged people. In this connection, he referred to the government’s various efforts for the welfare of the autistic children in Bangladesh. Senior officials of the high commission including Minister (Press) Farid Hossain and Head of Chancery Zahidul Islam were present on the occasion.